Ahhh that time of year again, and my chance to get all pink and girly and make valentines themed creations! If you read my other posts, you will know that I intended to make peppermint cremes in the style of buttons. Well I changed my mind again and instead, for the first time ever, I got imaginative with my baking and mixed a few ideas together to come up with my own creation! I made strawberry and vanilla cupcakes, with strawberry cream stars on the top! I used a combination of different recipes, mostly from The Hummingbird Bakery cookbook, which is one of my favourites, to make these cupcakes and I took plenty of photographs to show you the steps I took! The first step I took was to make the strawberry cream stars that go on top of the cupcakes. It is the exact same recipe to make peppermint cremes except that I replaced the mint flavouring for strawberry and I added a red food colouring to make them more appealing for the valentines theme. Once rolled out and cut out with my star cutters they were left to chill while I continued on to the next stage. The next step was the chop up all the sumptuous strawberries that would be the base of my cupcakes. I must admit I couldn't help eating a few whilst I was chopping them up to small pieces. Once cut I then divided them into the cupcake cases and moved onto making the cupcake mixture. This was a simple vanilla mixture from the Hummingbird Bakery cupcake book and yet again, I might have wiped up the last little dribbles with my finger... delicious! Twenty five minutes later, out came the golden cupcakes and left to cool. It was now the time to make some mouthwatering vanilla frosting, but instead of just scraping it onto the cupcakes using a flat knife like I have in the past, this time I got to use my new piping bag for the very first time! It wasn't as hard as I thought it was going to be, but it still took a few attempts and I'm not going to deny that they look a little rough! I think next time I will go a little slower and not worry if I don't finish them all. As it was my first try I was anxious to cover them all. The last finishing touch was to add the strawberry stars and voila, heavenly strawberry cupcake goodness! One last little note, I couldn't do a recent baking post without commenting on my friend Caroline's delicious raspberry butter cake that she baked for myself and a group of friends on a Pimms and Pictionary night. 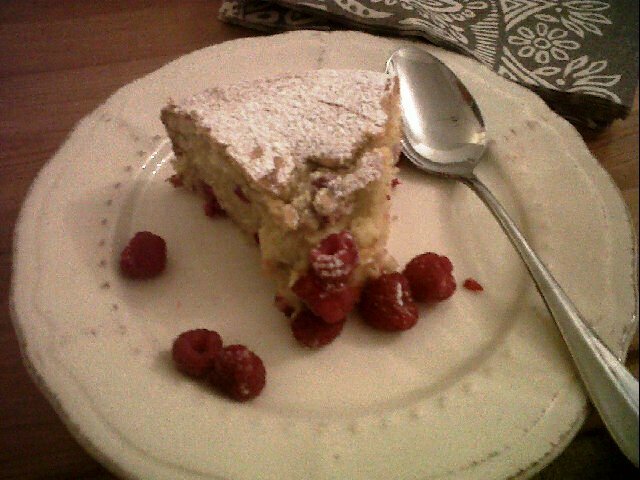 It was lovely, a light sponge with little bursts of flavour from the raspberries served with a dollop (or two) of clotted cream. Thank you Caroline!